Your parking pass purchase supports the Eugene Science Center’s educational programs as well as other community organizations including the Eugene Elks Lodge #357, ATA Team Pride in Cottage Grove, the Eugene Active 20-30 Club and the City of Eugene Department of Parks and Open Space. 10% discount for University of Oregon Alumni Association members. Eugene Science Center manages three parking lots located adjacent to Autzen Stadium, as shown on the map below. Eugene Science Center works closely with: the City of Eugene Police, Fire, and Parks Departments; Oregon Liquor Control Commission; the University of Oregon Athletic and Police Departments; Lane Transit District; and other agencies to ensure safety, compliance with laws and regulations, and to provide the best parking program available. All parking guests are required to observe the rules and conditions for parking in Eugene Science Center-managed lots. Read the 2018 rules here. PLEASE NOTE: All Eugene city parks are smoke-free. Rates remain unchanged for 2019! A season is defined as all regular season home games of the University of Oregon football team played at Autzen Stadium. The Spring Game is not considered part of the regular season. Cancellations incur a $25 processing fee, which is deducted from the refund amount. Both the parking pass and your Eugene Science Center membership card must be returned before the refund is processed, and must be returned prior to September 7, 2019. All refunds will be made by check. No cancellations can be made on the day of or after the first home game (September 7, 2019). Your parking pass will be sent in the mail. Protect your pass – it is the only way you will be allowed into the lots on game day. Replacement passes will incur a $50 replacement fee. SF1 Reserved Area passes (South/Path and West/Drive – see map above): A limited number of spaces are available in these two areas at this time. These passes MUST be purchased with this link. For SF1 regular, SF2, and SF3 car passes: This link is for regular car passes. Please note that the online purchase page looks a little different than it has in previous years, so please make sure that you are choosing the correct parking lot. Oversized vehicles: RVs, vehicles with trailers, cargo vans, sprinter vans, etc,: please call or send in the form (online purchase is not available). The parking registration form is available for download by clicking the button below. Call 541-682-7896; Visa, Mastercard, Discover, American Express accepted. Cash payments can be completed at the science center’s front desk, Tuesday – Sunday, 10AM – 4PM. Do not send cash through the mail. If our parking areas do not sell out with season pass sales, single game advance passes will be available for purchase in August. Availability will vary by lot and by game. If single game advance passes are available, information on how to purchase them will be posted on this page in August. NEW! Make your tailgate easy! We are pleased to announce our partnership with Tailgater Concierge. Tailgater Concierge provides premium pre-game tailgate packages to groups of all sizes in parking lot SF2. Packages include tents, tables, chairs, and coolers with ice, along with optional upgrades like BBQs, satellite televisions, and tailgate games. They take care of all set up and clean up so all you’ll have to do is show up and have fun! 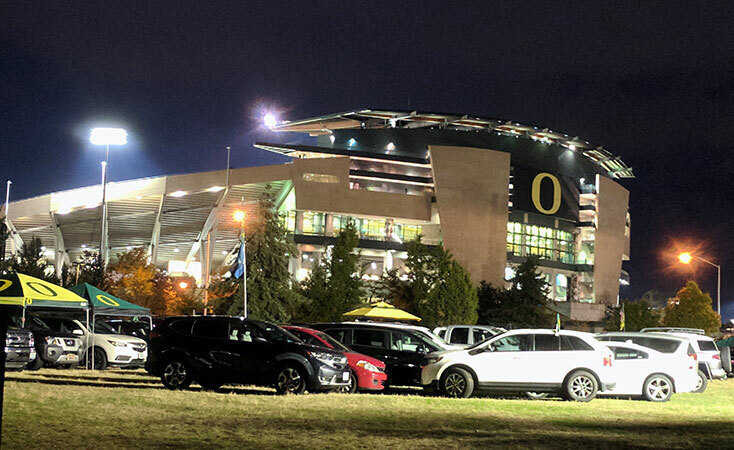 For more information about Tailgater Concierge or to reserve a tailgate experience, visit www.tailgaterconcierge.com/oregon or call 888-301-2190.